It is not a new idea to use BitLocker to encrypt the drive for data protection. 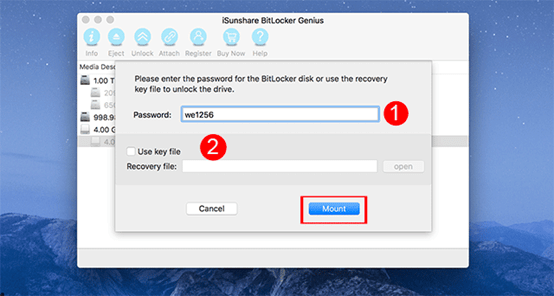 But if you want to open the BitLocker encrypted drive on Mac OS X, BitLocker Genius will be the best helper which allows you to open, read, access, and mount the BitLocker encrypted drive. 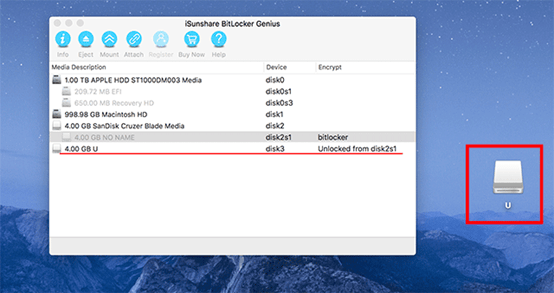 I am convinced that iSunshare BitLocker Genius is the best option for you to open BitLocker encrypted drive on Mac. It works efficiently and can mount and unmount the BitLocker encrypted drive, such as USB flash drive, in a few minutes. 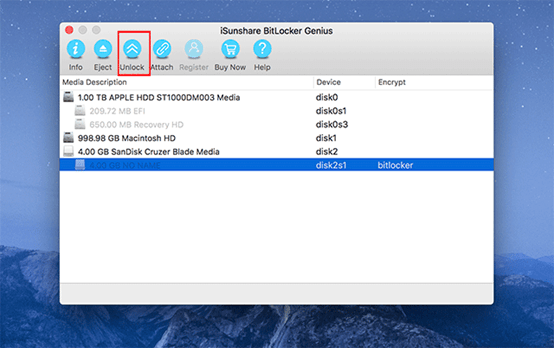 This BitLocker drive reader for Mac is very flexible and comes with the simple, friendly and highly intuitive user-interface, which can be easily grasped by every ordinary people. 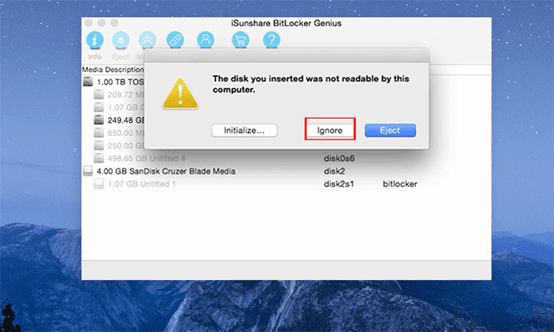 Enable users to unlock BitLocker-protected USB flash drive, external hard drive, memory card, Pen drive, etc. Has support for major file systems: FAT16, FAT 32, NTFS and exFAT. 100% safe and with no data at risk. You are offered two ways here to open a BitLocker encrypted drive, which is the same as on Windows— Password and Recovery Key file. There is no doubt that most people choose the password option. But when you forgot the password, this software enables you to access the BitLocker drive with a recovery key file. 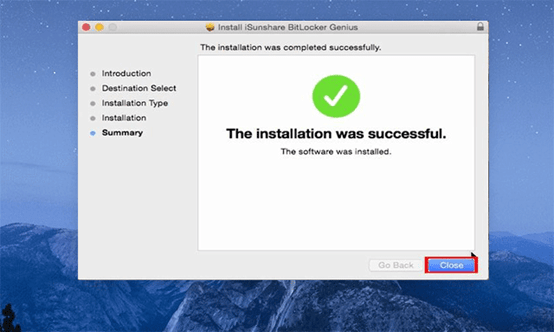 When you finished the software downloading, you should double-click the installation file, and you will get the iSunshare BitLocker Genius Installer. Click Continue > Install. It will take you a few minutes to get the software installed. In the end, click on the Close button. Insert the drive into Mac laptop, and you may get the following error tips: The disk you inserted was not readable by this computer. Click Ignore to go ahead. Open the software and choose your drive. Then, click the Unlock button. Enter the BitLocker password or open the recovery key file to unlock the drive. Finally, click the Mount button. Now, you can see that the drive is shown on the desktop. It is convenient for you to transfer the data from Mac to the drive or from the drive to Mac. All in all, you are in the control of the drive on Mac now. Considering the safety of your drive, you should click the Eject button to end the usage of the drive on your Mac. 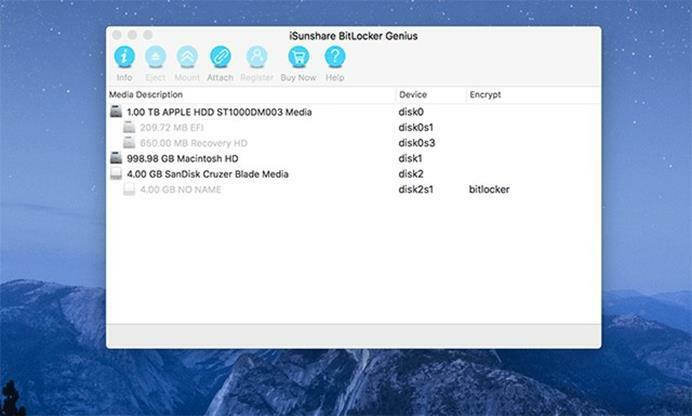 While I cannot predict what will happen tomorrow, I’ll definitely consider BitLocker genius an excellent solution for opening BitLocker encrypted drive on Mac OS X. 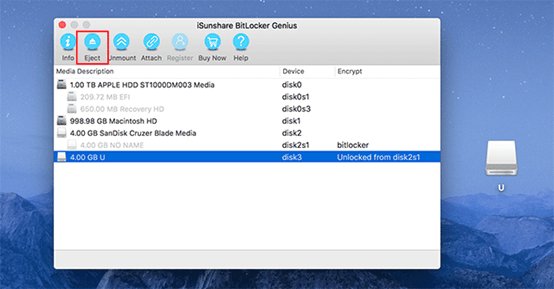 If you really need to get access to a BitLocker encrypted drive on Mac OS X, you can take advantage of iSunshare BitLocker Genius which is sold for $19.95 with lifetime updates and 24/7 customer services.